It is widely recognized that Europe is one of the main hubs for leading innovative and futuristic technology when it comes to the tire industry. That is why Tire Technology Expo 2014, held in Cologne, Germany, in February is always a popular show for all sectors of the international market. In fact, this year’s event was a record breaker as more exhibitors and visitors than ever attended the event which is presented over several halls and also provides a series of daily study conferences, courses and workshops. For me, Tire Technology Expo is a firm fixture in my annual business diary and this year it really did seem larger and more lively than ever before. While at the show, for the benefit of this article, I made a point of selecting particularly interesting booths and companies which appeared to be offering innovative products and services. Netherlands-based VMI was introducing its latest tire building innovation — the all-new MAXX ActiZone which is promoted as “the next generation” of the company’s MAXX Tire philosophy. In effect, the MAXX ActiZone operates as a unique “eyes and hands off” tire building machine which just needs a processor to oversee its operation. Another highly impressive feature includes indicating when reels are nearly empty so they can be replaced. Plus, in response to customer demand, it is also completely safe for operators to enter the machinery during the tire-building process to make corrections and adjustments courtesy of VMI’s revolutionary MAXX Entry Zone procedure. I also discovered that advancements in tire labelling were high on the agenda with another Netherlands company — Bandall International — making its debut at the show to promote a totally different type of tire label. I was informed that Bandall recently developed a special system whereby a film band is applied around the tire, therefore eliminating the current problems the industry is experiencing of too much adhesive on the label resulting in a residue being left on the tread. Also, when not enough adhesive is used the label very often falls off. Bandall’s new type of product labelling is already being successfully used globally in other industries including printing, food and pharmaceuticals. At the same time, UK-based Computype was launching a new label concept that ensures every tire has its own form of “numberplate” through unique barcoding identity. The barcode can then be tracked and read throughout the life of a tire from the building process right through to being recycled. Also making its debut was Computype’s exclusive High Speed Line Thermal Overprint System which provides a full color selection solution. Slovakian-based Mesnac European Research and Technical Centre, part of Qingdao Mesnac, used the event to further its growing presence in Europe and underline its specialist work in the research and development of tire building equipment. Mesnac is constantly creating new technologically advanced equipment in partnership with some of the world’s leading tire manufacturers. At the same time the company provides a comprehensive service in training and spare parts production and design. I also had an opportunity to chat with David Shaw of Tire Industry Research who was attending the event to promote his company’s initial product — a comprehensive industry report entitled “Sustainability in the Tire Industry 2014.” As former editor of the European Rubber Journal, Shaw has used his in-depth experience within the global tire markets to put together a unique and honest report on everything that anyone in the industry would want to know about tire sustainability. 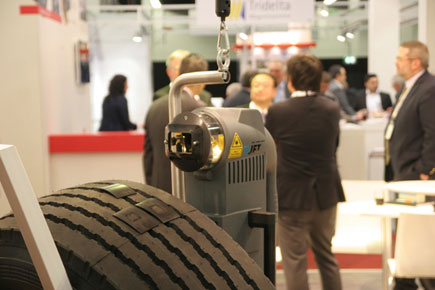 In the two days I trawled around the booths at the show there was a consistent buzz of activity, which gives the firm impression that ongoing revolutionary tire technology is alive and well in Europe. John Stone has been working within the global tire industry for over 20 years. In 2004 he launched his own company, Sapphire Media Services, as a business media consultant with clients around the globe. Stone also writes for tire and automotive-related publications in Europe, South Africa and Asia.